One of the more useful things I did to prepare for this jaunt into Asia was to check out what it was like to drive here–especially motorbiking. I was interested in safety of course, but also the law. There’s a good deal of material to peruse about this. Most of it is scary. I did not know what I was going to do. But I prepared by getting an international driver’s license here. This has turned out to be one of the best things I could have done. Four or five times a week, I scooter about 4-5 km to the huge 700-Year Athletic complex, built in 1996 to commemorate the 700th anniversary of the founding of Chiang Mai. 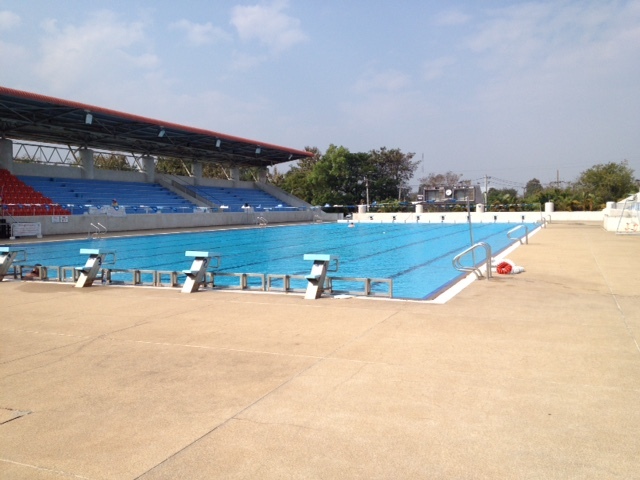 There is an olympic-size pool there that is barely used and it’s open every day. A week or so after renting the bike, I’m heading up Chottanna Rd toward the pool and I come upon a random police scooter dragnet license check operation. The road is coned off and I am pulled over. A cop sidles up to me and asks me where I’m going. He wants me to open the boot under the seat. He checks it out. I wonder what he’s looking for. He asks where I am from. He wants to see my license. I show him my international license. He lets me go, waving me on. Cops here seem (so far) quite personable. They speak enough english to converse with tourists. They are very polite. But make no mistake, they are all business. You do not mess with a Thai police officer. I realize much later, and after talking with some expats, that what he’s probably looking for in the boot is a bribe. A couple hundred baht usually works if you don’t have a license. Or so I am told. It’s cheaper than the fine and it’s cheaper than getting a license. I have since been stopped 7 times, at that same location and at others as well. But this Chottana Rd. location is a favorite because they can trap motorbikes there. They locate the operation so that there’s no place to turn around. I’ve even passed a couple of bikers who stopped as soon as they saw the police, but it was already too late. The only escape is to turn around and drive against traffic on the left shoulder of the road. Risky and obvious. I don’t need to turn around. I just chuckle to myself because I have what they want to see and I don’t need to commit bribery. This week, sure enough, there they were again. I pull over and right next to me is a cop I recognize. And he also recognizes me. He looks at me and says “You come here every day. Where you going?” Wai nam, I say, swimming. I’m going swimming. He waves me on without looking at my license. He knows I have one. The customary universal Thai greeting is “sawa dee” followed by a modifier corresponding to the gender of the speaker. The male gender modifier is “kahp,” which follows whatever I happen to be saying. 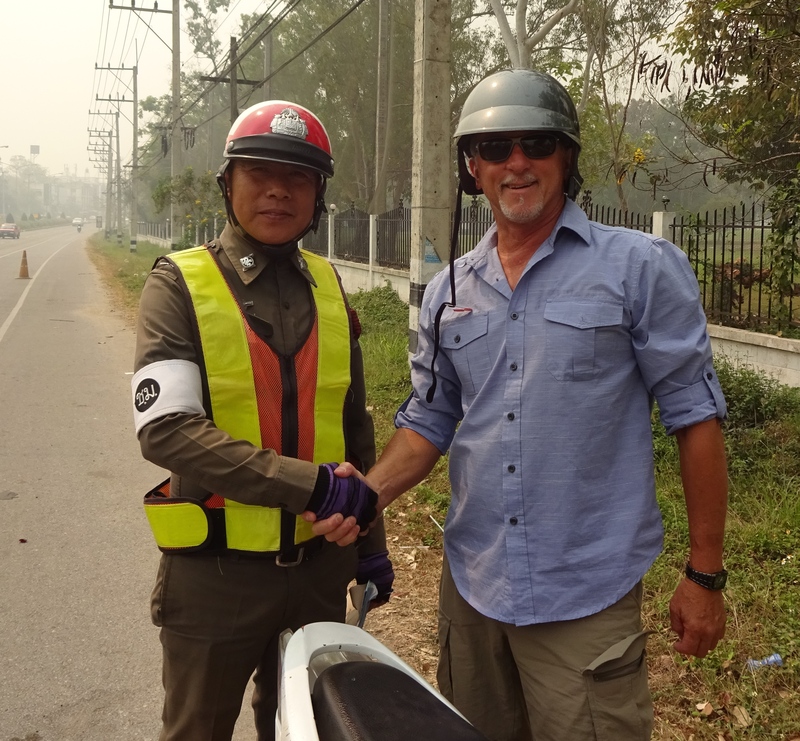 This entry was posted in Personal, Thailand, Travel and tagged international drivers license, motorbiking in Thailand, Thai license law, thai police by garyhorvitz. Bookmark the permalink. Gambling in this establishment? Why, rick, I’m shocked. Shocked.